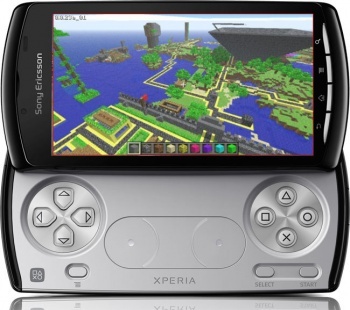 Mojang's mobile client for Minecraft will appear on Sony's as yet unreleased Xperia Play phone before any other device. Perhaps the only thing better than spending hours building your masterful castle in Minecraft in the comfort of your own home is to spend time building said castle when you are on the go. Given the fairly simple interface and low processing needs of Minecraft, it makes perfect sense for Markus Perrson to port his wildly popular game to a mobile device. The weird thing is that Mojang has apparently struck a deal with Sony for the client to appear on the untested Xperia Play before the versions it also confirmed it's creating for Apple's iPad and the standard Android OS. Mojang hasn't provided a timetable other than "this year," but the company plans to release early and often, just as it did with Minecraft. The game will be tweaked to deal with the special considerations of the smartphone. "When playing on smartphones you will have a different screen size compared to PC, different hardware, different attention spans and thus the game needs to be customized to fit the mobile specifications," a representative from Mojang told Gamasutra. Even with those changes, I'm not so sure that a mobile Minecraft is such a great idea. The only way it could work is if you can do tasks like harvest minerals on the same server that can later log onto at home for more finely tuned controls. It's a risky move, but I suppose it's worth a shot. Releasing on the Xperia Play first is also a gutsy move for Sony, trying to horn in on Minecraft fans that might not have been inclined to buy the new handheld game-phone. PS. I faked up that picture of Minecraft on the Xperia Play. I have no idea how the interface is really going to work.